Yellow Hats is a clean and multi-purpose HTML template for all kinds of Construction and Handyman Business. Yellow Hats Perfectly suited for Construction companies, Cleaning agencies, Mechanic workshops, Plumbers, Auto shop markets, Carpenter workshops, Maintenance services, Metal Construction companies, Mining services, Electricity and Power Companies, Renovation business & any kind of handyman business. 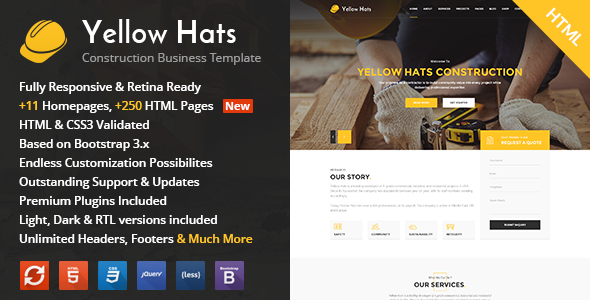 Yellow Hats template comes with necessary features and pages for Construction & Handyman websites such as About, Services, Testimonials, Clients, FAQ, Gallery, Products, Works, Portfolio, Architect, Awesome Blog/News pages, Questions & Answers and +150 awesome blocks and options. This HTML template can easily satisfy all of your needs.